When the Lamborghini Urus was first rumored many thought an SUV wearing the raging bull was just wrong. However, this isn’t the first time that the Italian performance car maker has made an off-road capable vehicle. But before we talk about Lamborghini’s SUV history, you have to begin with one of their most famous supercars. In the mid-1970’s the Lamborghini Countach was the image of what a supercar should be. It had a mid-mounted V12, a futuristic angular body and it introduced the “Lambo” doors. Beyond this it could scare you to death with its out of the world performance. The V12 engine in the supercar started at 3.9-liters and would grow all the way to 5.2-liters. Depending on the year power output would be as much as 455 horsepower. The top speed was claimed to be as much as 201 mph depending on the year. Sources close to Jay Leno have confirmed that his Will has recently been changed to leave his entire car collection to CBS. The change to his Last Will and Testament apparently was changed soon after NBC released the comedian. The former host of the Tonight Show has a large collection of cars ranging from steam cars and Duesenberg to Porsches and Lamborghinis. He also has a lot of interesting cars that aren’t necessarily popular models. Many felt that NBC didn’t treat him right when replacing him without it being his choice and while he was rated number one. This may be his way to make sure that he has the last laugh. According to sources CBS plans to use the collection in various TV shows. Update: for those who haven’t figured it out by the date that this was originally published (April 1st), this was an April Fools joke. We are sure that Jay will do something great with his cars when he does pass away (hopefully not for a very long time), but as far as we know he won’t be giving them to CBS or Fox. It has been another great week that was finished off with the Rolex 24 at Daytona endurance race. Below we count down our top 5 stories from the past week, just in case you missed anything. The Top 5 Reasons That The 911 Outlived The Front Engined Porsche Sports Cars – At one time in Porsche’s history the 911 was planned to be discontinued, to be replaced by the 928. We counted down the top 5 reasons it is still with us, which was a very popular article this week. We also seem to have ruffled a few feathers with the post, which lead to some good discussion. Question: Will You Be Watching The Rolex 24 In Daytona? – This weekend was the running of the Rolex 24 at Daytona. The endurance race is the first in the history of United Sportscar Racing and you let us know if you would be watching via the comments and social media. 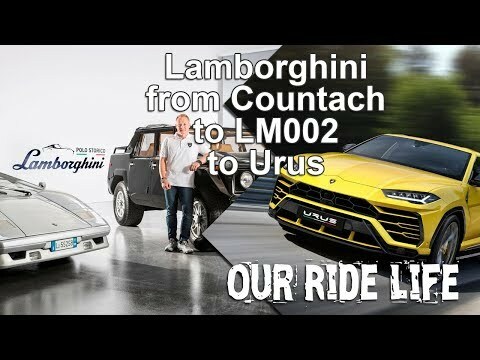 Video: Old School Or New School – Lamborghini Aventador Or Countach – Comparing the modern Aventador supercar with the car that the word was made up for, made for a very entertaining video. Top 5 Things We Hope Make It From The 918 Spyder To Other Porsches – The Porsche 918 Spyder offers many technical advancements and we counted down the top 5 things on the car that we would like to see on more affordable Porsches. Top 5 Features From The Porsche Carrera GT To Make It To Other Cars – The Carrera GT is one of the best supercars ever made. We put together a list of features from the supercar that made it to other cars.